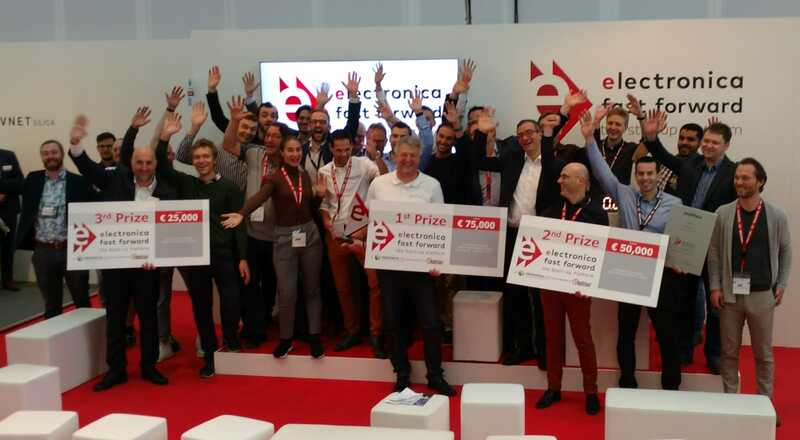 electronica 2018 – it’s a wrap! After 4 days with thousands of visitors, crowded halls, and impressive presentations of products, solutions, and information, the trade show came to an end. And it was the biggest ever – 80,000 visitors (increase of 10 percent compared to 2016 edition) arrived at the stands of more than 3,100 exhibitors (plus 8 percent) out of 50+ countries, showcased on a fairground area increased more than 20 percent. Key topics determining the present and future developments of the electronics industry were covered, included blockchain/cryptocurrency, artificial intelligence, and medical electronics. The importance of the show is reflected in the visitor satisfaction surveyed daily: 99 percent of visitors gave a rating of good to excellent – which is a new all-time high. electronica 2020 will take place in Munich from November 10 to 13 – Stay tuned! electronica Fast Forward Start-Up Award, presented by Elektor together with Messe München, was awarded for the second time. Plenty of electronics start-ups and engineers from around the globe entered the 2018 competition. After the reviewing the start-up and prototype entries, the electronica Fast Forward Awards judging panel selected a shortlist of seven finalists which competed against each other with short presentations to win a share with a total value of 150,000 Euro. On the first three days of the electronica 2018 fair, founders of start-ups from electronics industry and developers presented their ideas and prototypes to a jury of experts and to the public. At the Fast Forward Award 2018 ceremony today, Don Akkermans, CEO, Elektor, presented the winners. The winner of the electronica Fast Forward Award 2018 is Teiimo GmbH for its innovative textile system consisting of sensors, conductors and electronics for measurement and transmission of body and position data. The second prize is awarded to Wizama, which calls itself a “Magical Board Games factory”. Its submission to the competition is self-evident: Wizama presented an interactive board game console including an ecosystem of connected objects. En direct d’ @electronicaFair , Wizama remporte le 2nd prix sur une trentaine de #startup. Parmis les candidats, on a pu découvrir de superbes #innovations : @Teiimo, @volabo_GmbH, @SenseBox_De…! Un grand merci à nos techs pour ce fabuleux travail ?? The third prize goes to Querom Elektronik for its tailor-made power electronics solutions in the field of electromobility. A honorable mention by the jury was given to the “Cocktail Joe” mixing machine by Max Buschmann & Michael Buschmann which is able to produce more than 60 cocktails automatically. The electronica Fast Forward Award Ceremony! The electronica Fast Forward Award Ceremony! The best participants from all categories will battle against each other in the competition for the top prizes ? : bit.ly/2OMVWAv Did you join?